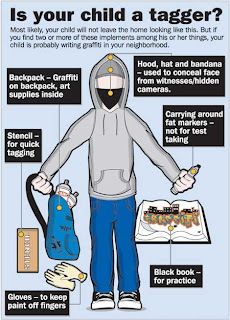 The tagger poster has been made available by the City of Santa Ana, in Orange County, California. In Garden Grove, Orange County, taggers will now be fined up to $1,000 for possession of graffiti instruments. The city will even make parents pay, if the tagger is a juvenile. The issuance of these citations will be starting March 1st. According to the Orange County Register, City Manager Matt Fertal said administrative fines are a "tried and tested tactic for Garden Grove." In the recent past, citations for illegal fireworks proved to be very effective after a city ordinance was passed allowing law enforcement to issue administrative citations to those shooting off illegal fireworks. Fertal also notes that the fines are a quicker more efficient way to handle these less serious offenses. Money collected from these fines will help pay for wiping out all the graffiti that's already been done. In other Orange County cities, taggers face criminal prosecution (and suspension of their license if convicted) in the court system rather than administrative fines, so Garden Grove taggers should count themselves lucky. (See also Penal Code Section 594, Vandalism and Penal Code Section 594.2, Possession of Vandalism Tools).